How can I upload my digital assets? There are two possible ways of uploading assets. Augmania creator supports a wide range of digital assets. You can upload images ( 360 images are supported), 3d objects, videos (360 videos are supported) , audio files, QR codes, add a location and animations. You can also add HTML5 code to build an interactive game. 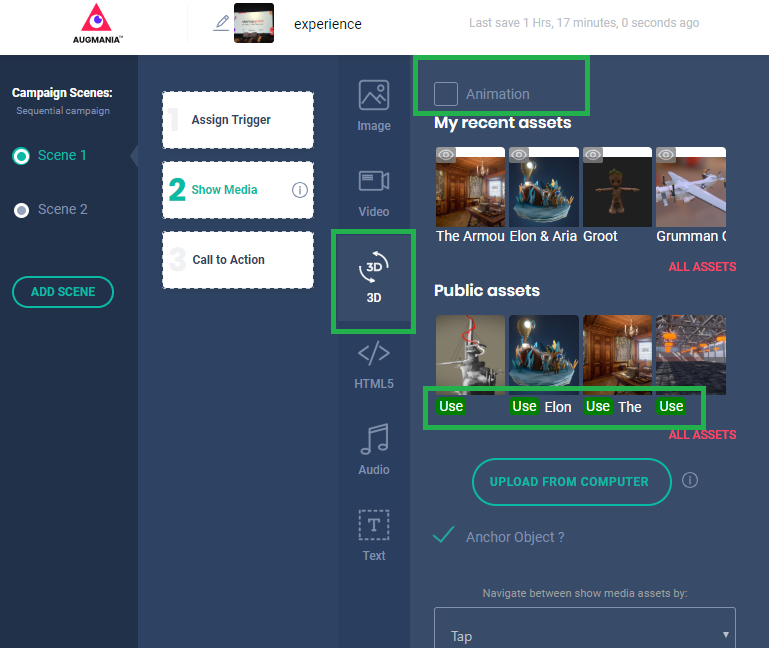 One way of uploading the digital assets is by doing it directly on the campaign panel by clicking on "Upload my assets from computer". For each step ( Assign Trigger, Show media, CTA), you can add your desired content from your computer into the creator. Another way you can use to add your assets is by doing it outside of the campaign panel through the "Assets" button. You click on it and then start uploading the different types of the content you wish to add. You can group it in a specific folder and sort it by type. From there, your assets will be automatically added to any campaign you create under "recent assets" where you can directly use it.